While “vegan” may be considered a four-letter word in mainstream America, going meat- and dairy-free is slowly growing popularity. And by slowly, we mean very slowly. A 2008 study done by the Vegetarian Times found that just about one million Americans claim to be vegan. But combine outspoken celeb vegans like Alicia Silverstone, Kristen Wiig and even former president Bill Clinton with the popularity of establishments like New York bakery BabyCakes and the diet is definitely getting a boost. November is National Vegan Month, and while the holidays can be a trying time for vegans and carnivores to come together, that's just the sort of peace-keeping moment Thanksgiving was made for. Popular vegan bloggers Sarah Kramer and Dynise Balcavage shared some of their favorite Thanksgiving sides, entrées and desserts. Make them for vegan guests, even if you're a staunch turkey-lover. You do want to be prepared if Bill Clinton makes a cameo appearance at your dinner, don't you? Dynise Balcavage: Philadelphia-based author of "Celebrate Vegan" cookbook and blogger behind UrbanVegan. About her recipes: "These recipes are so easy, decadent and delicious that no one will even notice that they happen to be plant-based – and healthy!" "This elegant dish looks as good as it tastes. The deeply autumnal figs and toasty pecans contrast nicely against the inherent sweetness of the squash and agave nectar." Rub insides of acorn squash halves with olive oil and sprinkle with salt and pepper. Turn upside down onto a foil-lined cookie sheet (For easy clean-up later). Bake for 30 to 40 minutes, or until soft. Meanwhile, mix remaining ingredients in a medium bowl. Remove squash from the oven and turn right side up. Fill halves with the fig mixture. Bake for about 25-30 minutes or until filling is soft and bubbly. Cool for about 10 minutes before serving. "Seitan is a protein made from gluten. When cooked, its texture is chewy and somewhat similar to meat, hence its nickname, 'wheat meat.' There’s something elegant and comforting about this harvest combination scented with warming, earthy herbs. This stewy dish makes its own gravy, perfect for serving with sweet potatoes, mashed potatoes or alongside any grain." Heat oil over medium in a large casserole. Add onions. Saaute until soft, about 5 mins. Add seitan. Saute, stirring constantly, about 10 minutes. Seitan should begin to brown a bit. Season with salt and pepper. Add quince, apple, veggie broth, spices and sage. Bring to a boil, then add brandy. Cook for a minute or two to allow alcohol to steam off. Turn heat to low. With a ladle, transfer about ¼ cup of broth to a separate bowl. Whisk in the cornstarch to make a slurry, then stir it into the seitan mixture. Cover and simmer for 20 minutes. Remove cover and cook for another 10 minutes. Adjust seasonings. Remove from heat and let sit for about 10 minutes before serving. "This is my go-to, New York-style, 'I’m going to impress an omnivore' dessert. It’s so rich and creamy that no one can believe it’s vegan. A little goes a long way." ﻿﻿Preheat oven to 325 degrees. In food processor, mix crust ingredients. Press into lightly oiled 9-inch spring form pan. Mix cake ingredients in food processor until very smooth, (Don’t be afraid of overmixing) then pour on top of crust into pan. Melt chocolate in microwave at 50 percent (about 3 minutes). Gently swirl this into the cheesecake mixture with a knife. Bake at 325 for 75 minutes. Cool completely, then refrigerate overnight. Slide a knife around the cake before removing the spring form from the pan base. Sarah Kramer: Dubbed "The World's Coolest Vegan," by Herbivore magazine, Sarah runs Sarah's Place, a vegan curio store in Victoria, British Columbia, Canada. 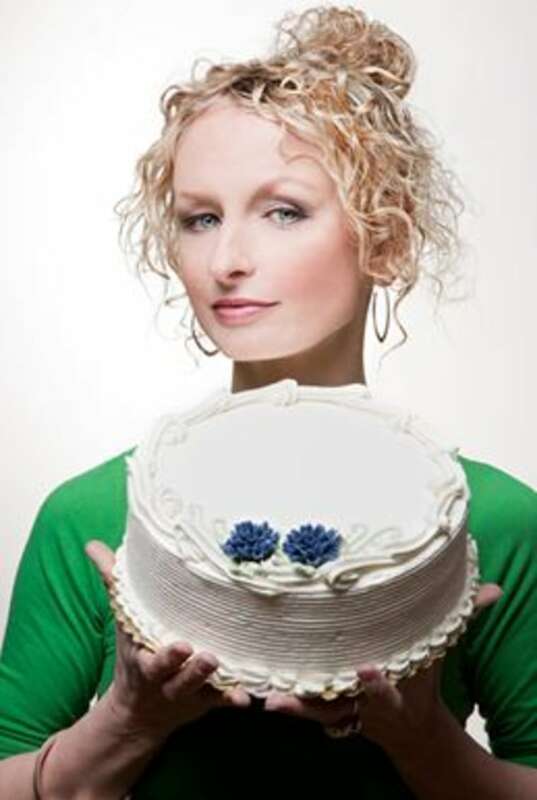 She's also the award-winning cookbook author of "How it all Vegan" and "La Dolce Vegan." "This delicious salad recipe is from my dear friends Sho and T in Toronto. They each have their own version of kale salad, so I took the best of both their recipes and combined it into a super-salad." Add 4 cups finely chopped kale,1/2 cup dried cranberries, 1 small grated beet, 1 small grated carrot, 1/4 cup pine nuts or walnuts into a large bowl and set aside. In a small bowl, whisk together dressing ingredients. Toss dressing in with salad and set aside. Let salad sit for 30–60 minutes, re-tossing every 10 minutes. This delightful dish is sure to have guests coming back for seconds. It tastes best when topped with Malloreigh’s Mushroom Gravy. In a medium pot of water, boil 3 medium roughly chopped potatoes until they can be pierced easily with a fork. In a medium saucepan, sauté 1 small chopped onion, 2 small chopped carrots, 1/2 cup chopped spinach, 1 chopped celery, and 2 large chopped tomatoes in 1 tbsp oil. Once carrots are tender, add 1/2 cup canned lentils, 1/2 tsp basil, 1/2 tsp salt, and 1 tbsp tamari. Stir and simmer without a lid until the liquid cooks off. Meanwhile, in a food processor or a medium bowl, mash the potatoes, 1⁄4 cup vegan “milk,” 1 tbsp margarine, and salt (to taste) with a potato masher or fork. Set aside. Pour the vegetable mixture into a lightly oiled pie plate and then layer the mashed potatoes over top. Bake for 15–20 minutes. In a medium saucepan on medium-high heat, sauté 4-6 finely chopped mushrooms in 2 tbsp margarine until soft. Add 3 tbsp flour, 1 tbsp nutritional yeast, 1/4 tsp pepper, and 1 tsp tamari; stir constantly until thickened. Whisk in 1 cup vegetable stock, 1⁄4 cup at a time, stirring constantly until thickened. Blend in food processor if you want smooth gravy or serve as is. Makes approximately 1 1⁄2 cups. "I’m thankful for pumpkins, for sugar and for this pie. Don’t worry that it won’t look ready when you first take it out of the oven—it sets as it cools." In a small bowl, stir together topping ingredients. Set aside. In a food processor, blend together unsweetened pumpkin puree, vegan “milk”, cornstarch, maple syrup, salt, sugar, cinnamon, ground ginger, allspice and vanilla extract until smooth. Pour pumpkin mixture into pie crust. Sprinkle topping evenly over top and bake for 40–45 minutes. Remove from oven and let cool. Serve at room temperature. Stuff your piehole with this: An all-pie Thanksgiving!